In order to pay tribute to Philippe's attachment to linguistic diversity, abstracts throughout the volume are provided in a variety of languages. However, out of concern for linguistic maximin, the reader will also find hereafter abstracts in the international lingua franca. 2I sketch a scheme of internet-vouchers for newspapers that will provide an alternative model for serious journalism now that the internet is killing the newspaper's traditional business model. The scheme is of special importance for non-English newspapers, whose language base is not large enough to sustain the advertising-only strategies that may be feasible for at least a few serious newspapers in the English speaking world. 3In Real Freedom for All, Ph. Van Parijs characterizes jobs as scarce, external resources that may justifiably be taxed in order to fund a basic income. Surprisingly, Van Parijs notes, in passing, that a tax on scarce marriage partners might possibly be justified on similar grounds. This essay revisits the analogy between jobs and marriages and concludes that marriage partners are not in principle scarce, although in practice they are. It follows that the first-best course of action is for the state to take measures (including basic income, national service, online dating regulation, and liberalization of marriage laws) to ensure fair access to marriage partners for those who wish to marry. In the absence of such reforms, a tax on marriage partners might be a defensible second-best measure. 4This paper sketches an argument in favor of a guaranteed income scheme as an essential tool for a transition toward more humanly and environmentally sustainable, frugal forms of economy in wealthy countries. In today's social democracy, citizens' choices as to the kinds of economic mechanisms they accept and want to live under are too restricted. We therefore present the case in favor of broadening the notion of equality of opportunity significantly beyond the one our societies are implicitly using nowadays in their social policies. We then draw the implications from this in terms of an ”Economic Transition Income” (ETI), designed to encourage citizens to act on their desires for systemic change and experiment with alternative economic arrangements. This scheme would, in our view, embody the ideal of a genuinely just society in these times of ecological and social turmoil. 5This paper explores the paradoxes and inconsistencies of the ideal of self-development with respect, primarily, to the contested question of the Self. This ideal has been very influential in the works of Hegel, Marx, and Mill, and continues to be so. However, it has been distorted and impoverished by a narrow psychological understanding that dominates our culture of success and results. I show that these wide-ranging inconsistencies clarify once we look at the concept of self-development as a political one. It only makes sense as a political and ideological, not as a psychological reality, and it requires specific political contexts and institutions to acquire any satisfactory content. Whereas self-development could be seen as a selfish liberal and individualistic ideal, it carries in fact a requirement that even successes and flourishing, not only handicaps and failures, are politically-dependent. 6It is common knowledge that people’s beliefs are determined by many factors. Having a good argument is only one of them. What are the implications of this fact for egalitarian political theorists who hope to contribute to social change? I argue that our arguments may do more to strengthen the confidence of our allies than to change the opinions of our opponents. 7Public authorities do provide many services, with a variety of goals in mind (justice, efficiency, stability, etc.). There are several ways to fund public services. Based on a conception of justice inspired by Ph. Van Parijs, this paper explores the respective advantages and limitations of general taxation versus user fees. I conclude with a few recommendations, taking into account the fiscal pressure that Western countries currently have to face. Real freedom for all turtles in Sugarscape? 8Sugarscape is an artificial world created by Epstein & Axtell with the aim of reproducing ”in silicon” the emergence of collective properties and complex social structures from the interplay of very simple heterogeneous agents (called here ”turtles”) struggling for survival in a simplified ecosystem. Building on the original Sugarscape model (Sugarscape 1) we simulate and compare two dramatic improvements in the conditions of these creatures with respect to the original model. In Sugarscape 1, the turtles act on a purely individualistic way, wandering on the landscape in search of the only available renewable resource (”sugar”) in danger of dying if they don’t find the indispensable amount of energy for surviving. In Sugarscape 2 they benefit from a conditional allowance in case they get stuck in a sterile part of the landscape, while contributing to the common granary in proportion of the sugar they harvest. The alternative improvement (Sugarscape 3) consists of an unconditional basic sugar income, granted to all turtles irrespective of their accumulated wealth or foraging activity. We compare the three worlds with respect to the number of agents still alive after 100 runs, the different survival probabilities according to talents and basic needs, and the wealth distribution. 9It is widely thought that linguistic and other forms of cultural diversity within nations are an impediment to public support for policies of egalitarian redistribution and economic security. I show that policies that reduce economic insecurity and practices that result in cultural standardization are substitutes; more of one reduces the value of the other. Or to put it more positively, linguistic diversity and economic security are complements: each enhances the citizens' benefits of having more of the other. 10The paper applies our ‘relationship goods’ approach to the topic of legitimate partiality between compatriots. By attending to the specificity of the goods produced by national relationships, and the kinds of partiality necessary for their production, we apply pressure to the analogy between families and nations. Distinguishing between national and political relationship goods, and making some general points about the gap between claims about the value of such goods and legitimations of partiality in particular circumstances, we emphasize the limits of the analogy. 11Over the past decades, tensions between the foundations of the welfare state have emerged in a more pronounced shape. Whereas social policy used to be primarily about redistribution and protection, current discourse increasingly refers to individual responsibility, merit and accountability. Using the Flemish disciplinary policy on truancy and school allowances as case in point, we demonstrate that this paradigm shift inevitably leads to a more stringent standard of reciprocity, which the most vulnerable will not always be able to meet. This implies an erosion of the ideal of social protection and encourages new forms of social exclusion. 12Many egalitarians, among whom "real libertarians" like Ph. Van Parijs, wish to assess distributions of freedom in a way that takes into account each person's whole life. Is the policy outcome of such a normative stance basic income (an income allocated at regular intervals during each person's life), or basic capital (a lump sum allocated only once to each person, at the beginning of her life)? The former answer depends on an "end state" interpretation of the concept of "freedom over whole lives"; the latter depends on a "starting gate" interpretation of that concept. On the basis of a reductionist conception of the person (due to D. Parfit), together with a particular idea of respect for persons (called "opacity respect"), it is possible to justify a combination of these two interpretations, and with this, the libertarian prescription of a combination of basic capital and basic income. 13The paper presents a novel hypothesis about the origins of a number of morally relevant traits found in hominids, elephants and some cetaceans, including self-awareness and the ability to take the perspective of others and to respond to their needs. The hypothesis relates those traits to high levels of maternal investment and oxytocin. The paper then explores the ethical implications of the hypothesis, and other findings regarding oxytocin and testosterone. It begins with the connection between oxytocin and morality, testosterone and crime, and it ends with some hormone-based proposals to re-engineer democratic institutions and to enhance humanity genetically. 14This paper explores the distant, classical and perhaps even older origins of what has come to be known as the "blaming the victim" syndrome. It starts from the following hypotheses. The syndrome was originally directed toward a heterogeneous group of people – the "dubious survivors", warriors who remained alive after their side’s defeat and raped women being paradigmatic examples. The paper focuses on the persistence of this syndrome, through the study of derived figures such as posthumously stigmatized assassinated Jewish masses and Muselmänner in Nazi extermination camps. Recent changes in the social reactions to such situations are then connected with the evolution towards more individualistic societies. 15Ph. Van Parijs has shown that basic income allows to combine social justice and individual freedom, two goals that are often considered to be incompatible. Why, then, does it remain so low on the political agenda? Probably because its implementation would generate such a big bang in our complex societies, a risk that no government is ready to take. This is why we should rather try to approach this goal gradually, be it through very small steps. 16In a joint article on linguistic justice, Ph. Van Parijs and I set out to define a criterion of cooperative justice whereby it is possible to determine an apportionment of the costs of production of a public good among cooperating agents. The proposed criterion, i.e. a sharing of costs proportionate to the benefits derived by each cooperant, did not take opportunity costs into consideration. After having shown that the non-factoring of this can render cooperation not worthwhile for some cooperants, the present text proposes a revision of our criterion of cooperative justice integrating opportunity costs. 17The debt crisis that hit the eurozone in 2010 forced European leaders to develop new solutions to deal with the crisis. These solutions have been misguided by the idea that sanctions should be imposed everywhere in the system. I argue that too much emphasis was put on designing punishment mechanisms to deal with the crisis and to prevent future ones and that a greater role should be given to forgiveness. 18Democracy is a contested concept. This means that the word has and receives different meanings. Yet we do use it a lot. Political science also talks a lot about democracy and increasingly so by assuming that it is facing a crisis. This assumption defines democracy as a process of political participation and representation. Citizens are therefore often asked whether they still trust democracy. But citizens are seldom asked what they actually mean by 'democracy'. Recent research in Belgium has shown that democracy means different things for different groups in society. And quite striking is the fact that language plays a role in this respect as well. Those who talk about democracy in Dutch are to some extent talking about different things than those who talk about it in French. 19In several articles, especially in ‘Must Europe be Belgian?’, Ph. Van Parijs has argued that language policies in Europe and worldwide should be designed in a ‘Belgian’ way. This Belgian solution implies that territories should be officially monolingual, which is essentially the case in the Belgian regions of Flanders and Wallonia. However, Belgium has a third region, Brussels, with an official bilingual language policy. Philippe argues for the universalization of the Flanders/Wallonia model. I argue for the opposite position: the universalization of the Brussels model. 20Every EU official document is currently translated into every one of the 23 official languages of the Union. It is highly improbable that the benefits of all these translations cover their cost. From an economic viewpoint, translations are public goods. The pure theory of public goods offers a finite algorithm permitting identification of a subset of languages into which systematic translations would be efficient, with some leeway for the country-sharing of the associated net benefits. Applying the principles of cooperative justice, de Briey and Van Parijs advocate equating across countries the ratios of costs to benefits associated with translations. The present note contrasts and integrates these two approaches. If Marx or Freud had never lived? 21In this paper I focus on the following counterfactual question: what if Marx or Freud had never lived? On the one hand, I look at their respective impact on the well-being of humanity and, on the other hand, at their impact on social theory. I also ask whether other writers or politicians would have taken their place and accomplished what they did. With the usual reservations and hesitations, I conclude that both the world and our understanding of it would have benefited had they never been born. English or Esperanto: a case for levelling down? 22It is argued here that, in contrast to the distribution of well-being, the distribution of status may exceptionally provide cases in which leveling down is, all things considered, desirable. The adoption of Esperanto rather than English as the lingua franca in the context of Ph. Van Parijs’ linguistic justice appears to be an example, even if well-being considerations also interfere and sway the preference in favour of English. 23Many argue for generous welfare states as a way of countering declining birth rates. But falling birth rates might be good, not just for the environment but also for welfare. Per capita wealth will probably be higher, and its distribution may well be more equal. Declining birth rates do pose a problem for Pay-As-You-Go pension systems, but it is a one-off problem of transitioning to a fully-funded system – a problem which could be solved by earmarking the next big social windfall (like North Sea oil) for the purpose or, failing that, by a special surcharge on the tax paid by one generation on bequests they receive from the previous generation. 24We describe a mobile-for-development project called M-Maji, Kiswahili for "M[obile]-water." Still in its early-stages, M-Maji aims to improve access to clean water—and thus improve human welfare and real freedom—in informal settlements in developing countries by using mobile technologies that have become widely accessible in even the lowest-income communities. Mobile development projects of this kind are often ineffective because they focus too much on technological solutions and are inattentive to user needs, preferences, and capacities. To avoid this limitation, we develop M-Maji using "human-centered design"—an approach to design that is anchored in ethnographic engagement with end-users. If M-Maji works, it will empower disadvantaged communities with better information about water availability, price, and quality. 25As the idea of Basic Income becomes more of a practical possibility, the political basis for its implementation grows in importance. Among the available rationales for its introduction are to combat the polarisation of incomes through globalisation and to curb the perverse effects of tax-benefit interactions. This paper argues that the proposal should be linked with a global social movement to address the precarious future of the young generation. 26For most commentators, there is a radical opposition between Karl Marx’s thought and the claims made for human rights. This interpretation has recently been shaken by David Leopold. In his book devoted to the young Karl Marx, he affirms that there is little sign of any hostility to the concept of rights in Marx’s early writings. Leopold's reading is not truly convincing. It seems difficult to deny that Marx remained in thrall to the ideological narrative of rights, without grasping what they might mean in practice and how they might be agents of radical change. Nevertheless, one can still argue that Marx’s thought suffers from a logical incoherence on the issue of rights and that it provides at its core the tools to resist the attacks made against human rights. 27In this essay, I summarize 11 claims presented at the Cuban Academy of Sciences in 2009. The setting was one of a quasi-experimental provocation intended to encourage a small audience of invited academics and experts to think about the future of the country and the Cuban model in terms of options, institutional learning, and decisions to be made – rather than in terms of fatalistic assumptions concerning the continuity of a system of political and economic order that is both petrified and evidently (as well as tacitly even known to be) unsustainable. While Cuba had so far escaped the implosive regime changes that occurred in Central and Eastern Europe in the 80s and 90s, I tried to convince the audience to consider elements of both liberal democracy and a private market economy as desirable vehicles of progressive societal learning and development. Unlike what can be observed about social democracy in much of the West, such institutional innovations do not necessarily stand in the way of socialist goals of socioeconomic justice and political autonomy. 28The most fundamental human need is the need to be properly cared for. While it is important that care arrangements be just, they are confronted with a dilemma: on the one hand a just treatment of care requires its revaluation; on the other hand such a revaluation can lead to a more unequal distribution of care. Can a universal citizen's duty to care contribute to a solution to this dilemma? 29Anti-state political philosophy, exemplified by that of Robert Nozick, has supplied an ideological basis for contemporary inequality. Economic theory has contributed as well: the transformation of focus from general-equilibrium theory to contract theory is associated with a view that the main function of the market is to provide incentives, rather than to coordinate economic activity. The focus on incentives has led to pessimism with regard to the feasibility of redistributive taxation. I argue that that the focus is misplaced, and the extreme polarization of incomes that characterizes the American economy is not a necessity of economic efficiency, but indeed hinders it. 30Psychologists have shown that human beings have difficulties with tradeoffs between sacred values such as life and health, and vulgar values such as material consumption – and that they will therefore look for escape routes to avoid them. Priority setting in health care is a typical example of such tradeoffs. I suggest that the procedural approach proposed by Daniels and the hypothetical approach proposed by Dworkin share important features with some of these psychological escape routes. This insight as such is not an argument to reject these sophisticated theories. Yet, it may help to see their shortcomings more clearly. Multilingual democracy and public sphere. What Belgium and the EU can learn from each other. 31Democratic theorists argue that transnational polities such as the EU cannot be considered democratically legitimate if corresponding public spheres do not develop. In this respect, the existence of merely national mass media, strongly focused on a national context, is considered problematic. However, this debate does not take into account that a federal multilingual polity such as Belgium deals with similar issues: media are organised on the level of the language communities and the content they produce does not allow us to speak of the existence of a federal public sphere. The case of Belgium either suggests that the premises and expectations of those arguing for transnational public spheres are unreasonable, or that the Belgian federation also faces a democratic legitimacy problem. We argue that the public sphere parallels between Belgium and the EU, can be partly explained by institutional similarities, mostly regarding party and electoral system. Therefore attempts to stimulate the development of public spheres at the level of Belgium and the EU should not so much focus on media reform, than on institutional reform. 32Theories of distributive justice that employ starting-gate conceptions of equality are commonly criticised for failing to underwrite a more than merely fleeting equality: their initially equal distribution of natural resource values is too easily transformable into sets of vastly unequal entitlements through persons’ iterative exercises of their unchosen and vastly unequal productive talents. This essay argues that this criticism is refutable inasmuch as such theories can plausibly extend their conception of natural resources so as to entail the elimination of unchosen inequalities of productive talent. 33Should some of the Belgian MP’s be elected in a single federal electoral district? This paper endorses such a proposal, advanced by the Pavia Group. It claims that it might bring a significant centripetal element in the Belgian consociative model. Nevertheless, one aspect of the proposal – the linguistic quotas – creates at least two problems: (a) the legitimacy problem, and (b) the problem of non-territorial quotas. By drawing lessons from the Swiss experience, this paper proposes three amendments to the Pavia Group proposal: a geometric mean to fill the seats reserved for each region, territorial instead of linguistic quotas, and a majoritarian electoral system instead of PR. Towards an unconditional basic income in Brazil? 34In this chapter, I reflect on the history of basic income in Brazil, based on first hand political experience. First, I detail how basic income came to inspire concrete policies in my home country. Second, I focus on the main social assistance program in Brazil today, the Bolsa Familia, which is widely regarded as one of the examples to be followed by other developing countries. Third, I explain why I think that a Citizen’s Basic Income (CBI) remains superior, in many ways, to such a conditional scheme. Finally, I try to show how we can move towards a true CBI in Brazil. Is it always better to clear up misunderstandings? 35Despite our inability to fully understand each other, we still try hard. As a result, we unavoidably end up with misunderstandings. Is this a problem? I argue that misunderstandings are not just inherent in human interactions and community life; they are also essential to it, for reasons having to do with respecting each other’s autonomy, preserving our capacity to surprise one another, and to act together despite the diversity of motivations that move each of us. Such a positive conception of misunderstandings carries some unexpected implications, including for our methods in the humanities and social sciences. 36Van Parijs’s case for the highest unconditional basic income asserts that the benefits of unequally held gifts - such as inheritances and scarce jobs - should be redistributed by means of taxation, to serve the goal of maximizing the real freedom of the least advantaged. Invoking Dworkin’s egalitarian auction model, Van Parijs argues that the fairest way of sharing the tax yield is to give all an equal share, regardless of willingness to work. In this chapter, however, I show that some gifts command auction prices which reflect a reward for the work required to obtain their benefits. If this outcome of the auction is properly taken aboard, then a fair redistribution of the tax yield must - at least in part - be conditional on people’s willingness to work. 37Marxists are committed to the elimination of exploitation of man by man. But they also believe that, for long stretches of history, exploitation is historically necessary. These two claims are in practical tension. As Engels would have it, this tension causes 'the leader of an extreme party' attempting premature revolution to be 'irrevocably lost'. This brief note argues against a Marxist attempt to alleviate this tension and sketches the moral predicament of revolutionists faced with it. Historical materialism entails a 'pantragic' view of history. 38Cities have largely been ignored by political philosophers. Yet an ever-increasing proportion of the world’s population lives in cities. The lack of fit between the theoretical concerns of political philosophers and the lived social and political realities of so many people is an oddity that needs to be addressed. My intention in this paper is to make a small contribution to that end. I want to make plausible the claim that cities should possess a greater measure of political self-determination than they presently do. In particular, they ought to exercise some degree of authority over what might be termed the spatial dimensions of urban life. 39This essay argues that Van Parijs’s notion of ”real freedom” does not capture the most important reasons why an adequate social protection system must include an unconditional income. ”Real freedom,” the freedom to do whatever one might want to do, is neither the most important freedom for people to have nor a freedom that necessarily explains why benefits must be unconditional and large enough to meet a person’s basic needs. It might not be possible to determine what kind of redistribution plan gives people the most ”real freedom.” Instead society must focus on protecting the most important freedoms, especially the freedom of voluntarily interaction and the freedom to refuse involuntary interaction: the power to say 'no'. This understanding of freedom provides a compelling reason why basic income must be unconditional. 40Suppose that a state must choose between making its least wealthy members as wealthy as possible and protecting a particular language as the primary means of communication in public life. If so, does that choice confront the state with conflicting moral requirements? This paper explores two ways of giving priority to the economic interests of the least advantaged members of society that suggest very different answers to this question. 41While reducing inequalities associated with gender constitutes movement in the direction of a just society, ultimately social justice requires genderlessness. The core idea is this: Gender relations are inherently coercive in the sense that they impose socially-enforced constraints on the choices and practices of men and women. This is what it means to say that gender is 'socially constructed'. Such constraints thwart egalitarian ideals of a world in which all people have equal access to the social and material means necessary to live a flourishing life. The capitalist road to communism: are we there yet? 42Twenty-five years after the publication of Van Parijs and van der Veen’s provocative ”Capitalist Road to Communism,” the global economy has achieved the abundance necessary for communism. The means and relations of production have evolved in a way that makes the elimination of the division of labor, private property, and class divisions—conditions critical to Marx’s vision of communism—possible. A basic income in the context of a global, networked economy, championed by a new and unexpected vanguard class, could fulfill Van Parijs and van der Veen’s original and ambitious claim. 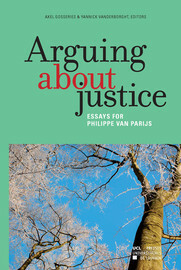 Abstracts In : Arguing about justice : Essays for Philippe Van Parijs [en ligne]. Louvain-la-Neuve : Presses universitaires de Louvain, 2011 (généré le 23 avril 2019). Disponible sur Internet : <http://books.openedition.org/pucl/1764>. ISBN : 9782875581969. Gosseries, Axel, et Philippe Vanderborght, (dir..) “Abstracts”. Louvain-la-Neuve : Presses universitaires de Louvain, 2011. (pp. 21-34) Web. <http://books.openedition.org/pucl/1764>.